Residential Cleaning Is our Life Blood.. Get a free quote today it only takes a few mins! If you’re looking for a family owned and operated company to handle all of your Central Florida power washing needs, look no further than the team here at Warren’s Power Washing. Our team has been in the Marion, Citrus, Levy, and Alachua counties for years and we are branching out into the surrounding areas. We work hard to make sure all your residential power washing services are covered. We provide a variety of services to help you keep your property looking it’s best at all times. From your pool enclosure to your roof and front driveway, we have got you taken care of! Whether you are in need of a freshened up patio or lanai, or your driveway is looking less than inviting, we have you covered! Our concrete/driveway cleaning services utilize the best of the best in cleaning substances and low-pressure washing techniques. We can remove stains while avoiding the “zebra stripes” that can sometimes appear when high-pressure washing is used. Our team will take care to use the perfect cleaning system needed for your concrete needs. A part of living in Florida is having a backyard pool oasis. Many of these oases have a pool enclosure that can become dingy and dirty with mold, mildew, and dirt. The best way to clean your pool enclosure is with our low-pressure system. We will not only clean your pool enclosure safely but also make sure that no debris is in the pool or no damage is done to your surrounding landscaping. We are also the go-to team for Pinch A Penny pools and their pool clients for cleaning their screens. Your home can develop stains on the outside due to well water that is popular in Florida or the humid conditions causing mold or algae to grow. Our low-pressure exterior house washing system can help you to get a clean, pristine looking home that you’ll be proud to invite your friends and family too. Your roof is another area of your home where the right non-pressure cleaning systems are important. Florida homes can develop dark discolorations of their roofs which in most cases is algae growth. By working with our team we can help you to get rid of the algae or debris, improve your shingles lifespan, and get the most out of your roof. Check out our residential services listed above or contact our office for more details. Our highly experienced team is ready to assist you with all your low-pressure washing needs. Whether you have vinyl siding or concrete stucco, your home in Marion, Citrus or Levy County will need regular washing. Due to the humid and hot conditions in Central Florida, your home will be a breeding ground for mold or mildew, not to mention the rust that well water can leave behind. Hiring a professional to take care of your exterior house washing means that your home will always look it’s best no matter what conditions it faces. 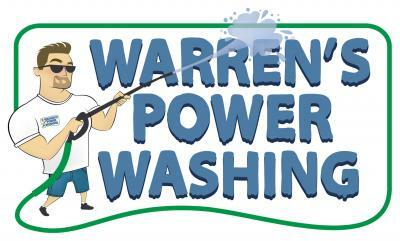 Warren’s Power Washing is a family owned and operated company that has many years of experience in the exterior house washing and maintenance here in Marion County and surrounding areas. Our team has experience in all of the latest advancements in cleaning homes with a soft, low-pressure system that reduces the risk of damage but leaves it clean and in pristine shape. Whether you’re in need of cleaning services for your home, patio, lanai, or other exterior house needs, Warren’s Power Washing has you covered. Utilizing a variety of water temperatures and cleaning substances, our team will make sure your home looks as good as the day you moved in. Our team will not only clean your home, they also protect your landscaped areas as they do so. Someone is always making sure that your shrubs and flower beds are covered while the exterior house washing is being performed. You can trust that the experienced professionals who arrive at your home to clean the property will know just how much pressure to use. Too much pressure can cause damage while too little pressure will not get the home clean. Our technicians use the perfect amount of low-pressure soft washing systems to get your home looking crystal clean! Contact our office today to schedule your residential exterior house washing. Make sure you’re ready to face any party or event you have while protecting your home from damaging stains, mildew and fungus. Cleaning your roof is probably the last thing on your mind. You’re gearing up for a fun summer as the temperatures heat up in the Central Florida area. Making sure your roof is clean is the last thing on your list, but it should be one of the first ones. A clean roof is not only nice to look at, it is also a way to make sure your roof and shingles perform as they should. Without a properly cleaned roof, you could be looking at issues with energy efficiency and needing a new roof sooner than later. Our team here at Warren’s Power Washing has perfected the non-pressure roof cleaning system to make sure our tri-county residents are taken care of. From Marion to Citrus and Alachua, we know what it means to keep a nice clean roof here in Central Florida. The non-pressure roof cleaning system we use will help you to extend the life of your shingles, have an attractive home, and make sure that you do not deal with unsightly mold and Algae. No matter the color of your shingles, there are some discolorations that just should not be on your roof. Here in Florida, you’ll deal with certain types of algae that grow on your roof that cause dark discolorations. That discoloration is not only unsightly but also interferes with your roof doing the job it was made to do. The most common algae you’ll see is called Gloeocapsa Magma. This causes the dark coloring on your roof that otherwise wouldn’t be there. That is where the non-pressure roof cleaning systems come in from our family owned and operated team. We are here to help you get the most out of your roof by removing this algae and other debris. If you are dealing with unsightly discolorations, call our office and schedule your non-pressure roof cleaning. We can help you make sure to get the most out of your roof while saving you money too! At WarrensPowerWashing we use all the up to date methods of cleaning your driveway / concrete surfaces. Gone are the days of blasting away dirt using the highest PSI that your machine can generate with a wand of your choice. All professional pressure washers use a Surface Cleaner to clean your concrete. What a surface cleaner does that a wand cannot is provide even spray coverage to the area being cleaned. When using a wand, you use is as a pendulum, the distance varies from left to right as you clean an area. A surface cleaner provides an even cleaning pattern which eliminates the “ZEBRA MARKS” on your concrete. At WarrensPowerwashing we have every state of the art tool to our disposal. We have the use of different types of surface cleaners, HOT WATER, COLD WATER, and several different types of professional cleaners. When we clean your concrete surface, we evaluate what the best tactic to take, Hot or Cold, pretreat with a cleaner and/or post treat to brighten it up and kill any organic growth you may have. ***Proper Maintenance between cleaning will help to keep your property as clean as possible. Proper Drainage: Eliminate as much water accumulation as possible. Where water sits and drains slowly will promote dirt and mildew growth. Trim Shrubs: Trimming shrubs and keeping plants off the concrete will also help in keeping your surface clean. One popular fixture for homes in Central Florida is a pool. In most cases, that means a pool enclosure is also involved. While the beautiful, warm, sunny weather is perfect for days at the pool, it is also a perfect combination for mold and mildew to develop on the screen enclosure itself. This is why it is important that regular screen enclosure cleaning services are a part of your regular maintenance schedule. Here at Warren’s Power Washing, we work hard to make sure your pool enclosures are in pristine condition while protecting your landscaping and pool/patio areas. Our team is highly trained and experienced in the various types of pool enclosure in the Central Florida area. We are also the go-to cleaning company for Pinch-A-Penny for all their pool customers. Our team works diligently with the latest up-to-date tools and cleaners to remove any type of algae, mold, or mildew that has taken up residence in your screen room/pool enclosure area. We utilize low-pressure cleaning systems that help to thoroughly remove the dirt and debris from the screen without tearing it. Unfortunately, many people have found out the hard way that hard pressure cleaning systems will damage their pool enclosures. We take pride in making sure that our team leaves your home in tip-top condition after your service call. Our professional pool enclosure team will come in, clean the area while protecting your plants and pool, and leave it sparkling like we were never there. With our professional cleaners, experience in the industry, and low-pressure system, we can make sure your pool enclosure is perfect every time. Contact our office for your consultation or your an appointment for cleaning your pool enclosure. Don’t risk the damage that high-pressure systems can cause. Be sure to trust the family owned and operated company that is highly ranked with pool professionals in the area. We are a Full Service Exterior Cleaning Company that services all of Marion, Lake, Sumnter and Citrus Counties.